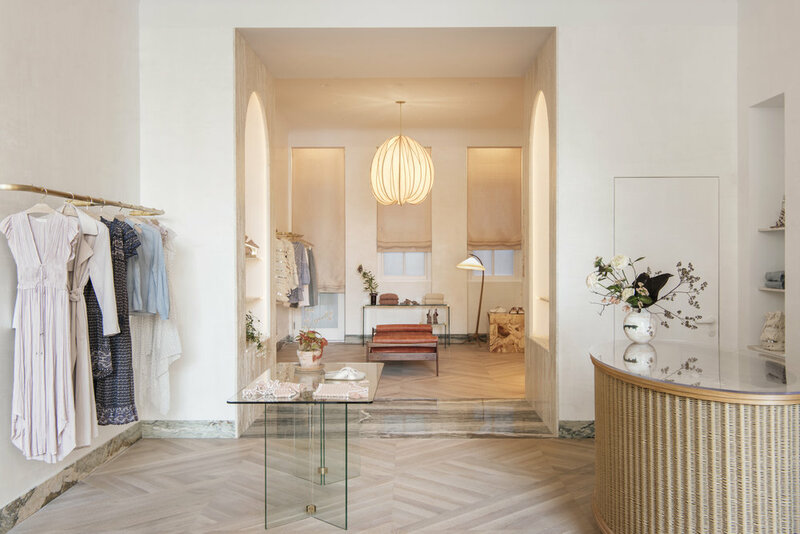 The Ulla Johnson store is located on a landmarked block of Bleecker Street in the historic district of Noho located in Manhattan's Greenwich Village. The project was a complete gut renovation with only the historic copper storefront remaining, which was (newly) polished after our work was complete. The renovation included a new layout, all new finishes and fixtures, new lighting, new street signage, new HVAC and life-safety systems. One of the central goals of the project was to create a retail space that felt as comfortable as a residential interior. The design team used many elements and proportions taken from residential interiors to create an entirely new architectural layout with familiar residential details while adding custom commercial elements that will hold up to commercial use. The concept behind the new architectural floor plan was to break up the long retail space into a more residentially proportioned space with front and rear "parlors" connected by a decorative pass-through, while providing two dressing rooms off of the rear parlor and a bathroom for staff beside the sales desk. Though the building was not designed as a townhouse the new layout creates a space inside of a commercial building that is similar to a parlor level in a New York City townhouse. Every finish throughout the store was replaced including a custom irregularly laid-out white oak chevron floor and a green marble base that wraps the perimeter of the store and transitions into the floor surface of the decorative pass-through between the main rooms. The high ceilings were emphasized with exaggerated tall mirrors and soft coved crowns where the walls meet the ceiling. The appearance of taller windows was created by building new tall frames with artificial light installed behind new window treatments to transform the low windows and further emphasize the height of the ceilings. Soft, muted tones with varying textures provided by stone, wood, and plaster were carefully selected to highlight the clothing and palette of Ulla Johnson's collections. 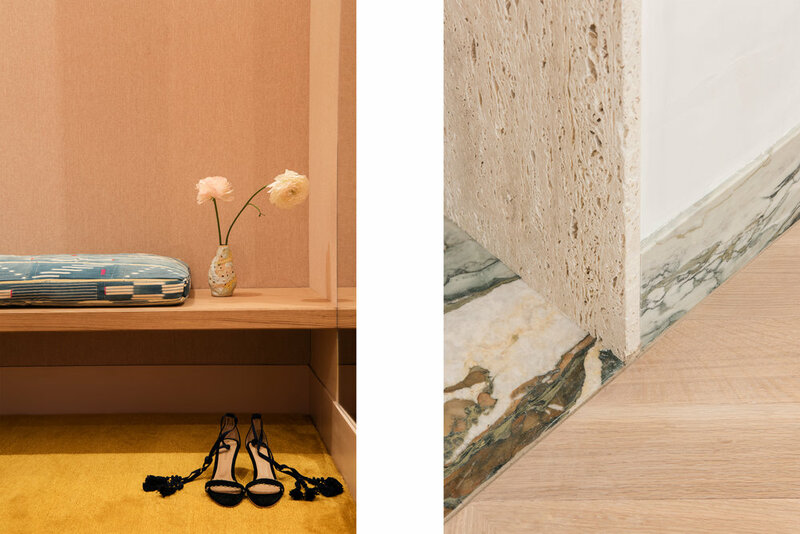 The oval shape of the custom sales desk was derived as a departure from the rectangular shape of the interiors and the materials were carefully selected to compliment Ulla Johnson's clothes and accessories. The body of the desk is composed of oak dowels that are hand-wrapped with Danish cord. The tops of the dowels are expressed with brass caps seen through the glass countertop, which also reveals jewelry display for the store. The rear of the sales desk holds all of the electronics and equipment necessary for check-out and wrapping of merchandise. Inspired by details from Carl Aubock's workshop and adding to the hand-crafted feel of the interior, the ends of the custom unlacquered brass racks were hand-wrapped with rattan and mounted at various heights throughout the space. Niches for the display of merchandise and art are located throughout the store and were carved out of false walls that were constructed to contain the steel necessary to support floating racks. Dressing rooms were meticulously detailed with brass ceilings and custom lighting niches, fabric, and decorative hardware and lights. The historic, copper storefront was polished and then left to patina for twenty-four hours before sealing it in order to capture the perfect color to compliment the interior of the store and Ulla Johnson's collections. Elizabeth Roberts Architecture & Design, PC was hired to do the project along with Alexis Brown Interiors who collaborated on the interiors with our interior design team. The project was a highly collaborative and extremely creative process involving many talented and visionary team members including our client Ulla Johnson who along with everyone else on the team added to the final product in a significant and meaningful way.